The paper vs. plastic bag debate is an interesting one. The debate should reach far beyond which type of grocery bag to choose at the checkout. Whether paper bags or plastic bags are best, or perhaps least worst, for the environment is frequently discussed. Most people, without giving the matter a great deal of thought, would automatically think that plastic bags were the biggest hazard to the environment. We are all aware of the eyesore that plastic bags can cause. Lightweight plastic bags can get caught by the wind and get blown away from bins. They can get caught in trees, get blown into fields where they can cause problems for livestock or enter rivers or the sea where they can kill fish, marine life and birds. On the other hand, when we think of paper, we often think of recycled paper bags which, in turn, can be recycled after use. Paper conjures up an image of a natural product while plastic gives the image of something artificial that harms the environment. In reality, however, both paper and plastic have their negative points and cause harm to the environment. When looking at paper vs. plastic and the impact on the environment, it is important to take all aspects into account. This does not simply mean looking at how the bags are disposed of or how long they take to decompose. Instead, the entire life cycle of the bag needs to be considered, and this includes looking at how the bags are made, the raw materials and the energy used to make the bags as well as how they are later disposed of. In addition to this, the amount of energy used to transport the bags from the place of origin, plus the environmental cost of storage, also needs to be factored into the equation. Paper comes from trees which are a renewable resource when grown sustainably. However, paper also requires a great deal of energy during production. According to The Kansas Green Guide, 14 million trees were used to make the 10 billion paper grocery bags that were used in the United States in 1999. This has two negative impacts on the environment. The manufacturing process produces greenhouse gases while the effect of reducing the number of trees means that there are fewer trees to absorb greenhouse gases. Paper can be recycled, and the pulp is used to create many new paper items. The recycling process uses many chemicals to treat the wood pulp so it can be reused. Plastic is made from oil, which is a non-renewable resource. This has an obvious detrimental effect on the environment. Plastic also requires a great deal of energy to produce. 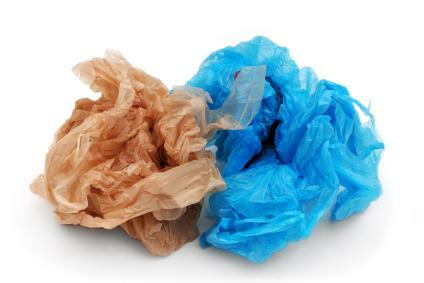 TreeHugger reports that the largest energy input into the plastic bag manufacturing process is electricity. In the United States, half of this energy comes from coal burning power plants. This, again, has a negative impact on the environment. Plastics can be recycled. The recycling process means that plastics are often down-cycled, which means that they produce a lesser-quality material after each recycling. One of the best ways to help the environment is to re-use bags. Whether this means reusing plastic grocery bags or making fabric grocery bags, this helps reduce the amount of new bags used that are disposed of each year. The issues regarding paper vs. plastic bags are important and as such regular research is being carried out by governments, organizations and corporations throughout the world looking at the long term effect on the environment of these products as well as developing alternatives. There are many places to look for up-to-date information. When looking for information on the Internet, it is always important to bear in mind that information can be presented in ways that will help further a cause. Therefore this needs to be factored in when looking at information on single-issue websites. Information also quickly goes out of date, therefore it is also important to go back to the source study, whenever possible, to ensure that the latest information is available.